« Does the R-word = the N-word? sounds really interesting ed. wish i could make it. As I wrote on your facebook post, this is one of the seminal books of our times. I have recommended it to all my students, dozens of pastors and hundreds of seminar participants over the last decade. Michael Emerson in particular is filled with insight on these issues and is very approachable and generous with his time to those who want to dialog. 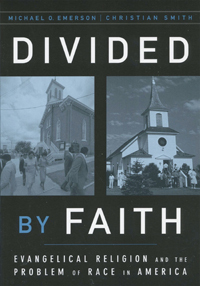 The follow-up book, UNITED BY FAITH is also good. In Divided by Faith, the problem is examined and explained. In United by Faith, new directions are posited. I know you know this Ed. I just wanted to get it out for your readers. I have a friend who attends Indiana Wesleyan. I live within a few hours of there but can’t go. Shoot! I will also be among the missing at this event. I’d love to be there and get to meet a lot more of the folks I know from here in cyberspace. I’m glad that you are going to interview Dr. Emerson. I think that this may help more of us to connect the dots and see the larger picture of GOD’s activity over this past decade. A lot of good work has already been done, but much more lies ahead of us. I hope that there will be a good turnout, but I’m also looking forward to accessing either some transcripts or audio from the event when it’s completed. Keep us informed. So, the event is over now. How was it? Was it well attended? Are there any transcripts or audio recordings available? Do tell us all about it. Ed, Im late to the game. When can you give us an update? Is there a video floating around somewhere? Video was finally posted. Check out my latest post here for more info. Thanks for your interest and support. I too would love to hear how this went. Please give us an update. This book was one of the main books I used in the review of the literature for my dissertation. Thanks for your interest, Joel. Check out my reply to Ron above for an update and video from the event.